Impress your friends with this math multiplication magic trick from Murderous Maths! Kids tell a friend to put a square around 9 numbers on a calendar ( 3 x 3 box). Then, they say they can find the sum of the 9 numbers within the square in a flash! Abracadabra and alakazam! All they do is multiply the number in the center of the square by 9 and presto! They magically have the answer! Note: For larger numbers that may be hard to do the multiplication in your head, multiply the middle number by 10 and then subtract by the middle number. For example, 11 is in the middle, 11 x 10 = 110, 110 - 11 = 99! You can do this trick on any number grid! 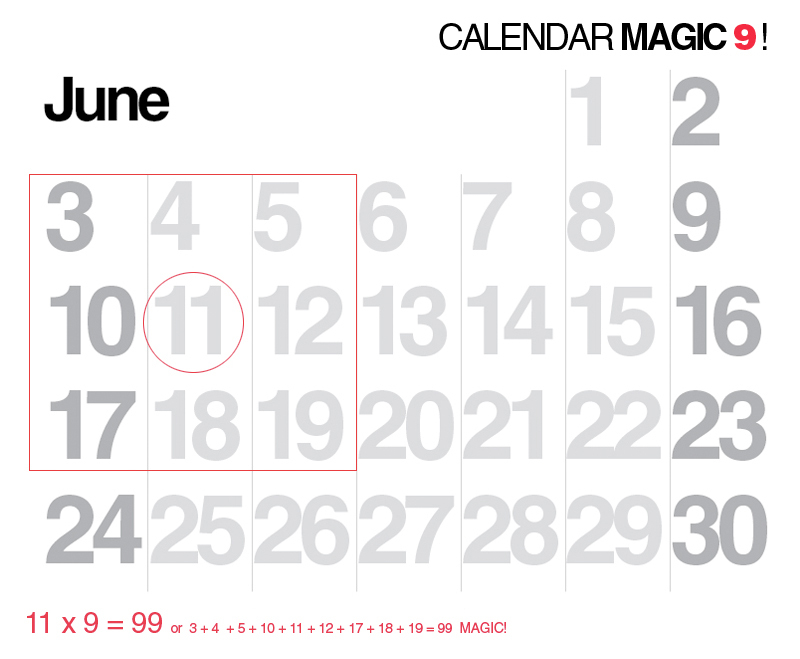 Also, try Calendar Magic 20 trick, click here for the magic secret and other mysterious math tricks!